Shellharbour is located just over 100 kilometres south of the centre of Sydney. This makes it within 90 minutes drive of most people in the metropolitan area, and much close for those of us who live south of the Harbour. There are a number of good shore dives (The Gutter, Bushrangers Bay and the Gravel Loader) here as well as many great boat dives. 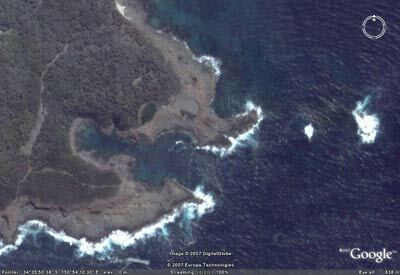 As close as this location is to Sydney, not many divers travel the short distance to dive Shellharbour except to do shore dives. It is almost unknown for people to go there for a weekend. Well, the dive Club of which I am a member St George Scuba Club, has over the period since 2000 had a weekend dive trip to Shellharbour each year. These have been very well attended. 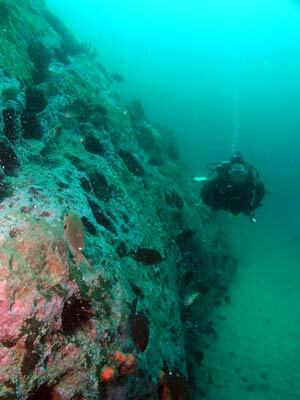 During these trips, we have explored the area a bit and found some great dive sites. Some of these are, of course, known to the local dive shops (as of early 2006 there are three, way too many for such a location, at least one will fail, there is no way there is enough divers to support all three - latest news - February 2007 shows there is now only two again). From Shellharbour Boat Ramp, head out towards Bass Point (this is the point to the south-east from the boat harbour). Make sure you skirt the shallow reef that runs north from the first point and then head south. You will see that there is a small island (really a series of rocks that sticks up above the water, even at high tide). This is Bass Point Island. 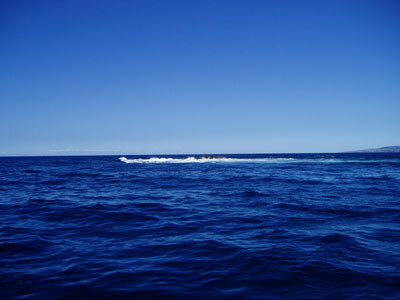 To the immediate west-south-west of the island there is a bombora (bommie) that comes up to a few metres from the surface. This can break in even slight seas. Make sure you are aware of its location at all times so you do not get caught and rolled. It is 4 kilometres from the boat ramp at Shellharbour Harbour to the site. Anyway, you can run right around the bommie and you will see that the section between the bommie and the island is about 5 to 8 metres deep and the channel between the bommie and Bass Point is about 23 to 25 metres. On the western side at GPS Reading 34° 35' 55.6"S 150° 54' 13.8"E (using AUS66 as datum - see my GPS page for details or you may not find) is a good spot to anchor if the conditions are suitable (that is the bommie is not breaking too badly). Once on the bottom you will see that it is composed of small rocks and a short distance to the south is sand. Follow the rocks to the east and you will soon see the bottom of the wall. This leads up to the bommie. Follow the wall to the south and then the east as it turns. This is a shear wall which runs right up to the top of the bommie in some spots. In other spots, it has a ledge at perhaps 15 to 18 metres. The rock does not have many sponges or sea squirts, probably because they get ripped off by the large seas that would hit this southern face at times. The reef looks very similar to the bottom at the deep end of Fish Rock at South West Rocks. After 30 metres the wall turns to the north and then splits into two sections. One heads to the north-east (probably going around the island) while the other skirts the bommie. This goes up and over the ridge between the bommie and island. I have not explored this section. If conditions permit, you can go up and over then then down and back to the west. This will bring you back to the channel. If you cannot go over, head back the way you came, perhaps a little higher. When you are back on the western side, you can go up onto the top of this western section of the bommie. There are lots of bream here. To complete the dive, drop back to the channel bottom. You can even go over to the mainland and look at this wall before returning to the anchor. This site has fantastic fishlife, huge schools of yellowtail, seapike, one-spot pullers, nannygais and more. As mentioned, there are many large bream on the top of the bommie and I would expect you would see luderick and blackfish. We have also see lots of large rays, including on the one dive, a huge bullray, a medium bullray and a small eagle ray and a large eagle ray. We have also seen boarfish and Moorish idols. This is a great dive, one of the best I have done on the South Coast of NSW.